I’ve said it before and I’ll say it again: many of my most beloved travel memories are wrapped up in the new and exquisite flavors I experience at restaurants around the world, whether they’re distinguished, multiple-award-winning establishments or a food cart in the midst of a bustling market. It’s such a joy to stumble upon a oft-overlooked eatery, a place most frequented by locals – and often, it’s those same locals who are delighted that you have found them and welcome you in like family. Fred’s: Recently awarded the title of Best New Restaurant of the Year in the Australian Gourmet Travelers 2018 National Restaurant Awards, Fred’s is tucked away in the trendy suburb of Paddington (10 minutes from Sydney CBD). The restaurant has been designed to feel like you’re dining in someone’s home: it is warm, inviting and understated with the kitchen bench taking centerstage in the dining room (you may even arrange for your clients to sit at the bench). The menu brims with deliciously prepared and ethically produced seasonal fare under the direction of head chef Danielle Alvarez (formerly of San Francisco’s Chez Panisse). The same approach applies to innovative pre-dinner cocktails and nightcaps in Charlie Park’s, the speakeasy-style bar downstairs. As it is particularly popular with local Sydney residents, we advise you to make reservations early. Berowra Waters Inn: For a completely removed dining experience, arrange for a meal at Berowra Waters Inn, accessible only by water – or by seaplane as one soars above the city and its beautiful Northern Beaches for 20 minutes before arriving for a most memorable meal. Nestled among the gum trees with the water lapping at its feet, the Inn is open for lunch Thursday through Sunday. 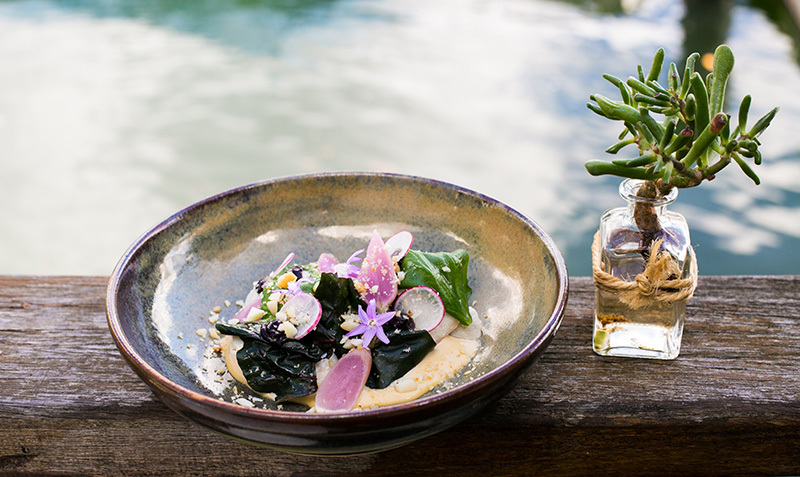 A menu showcasing fresh local produce, with organic and biodynamic items from local purveyors whenever possible, is complemented by stunning views across the Berowra River to dramatic sandstone cliffs and native Australian bushlands. If you clients enjoy the cache of arriving for a meal via seaplane, consider Cottage Point Inn, the Boathouse Palm Beach and Jonah’s at Whale Beach, all offering great food, fabulous views and a unique seaplane-accessible location. Ester: In an intimate and simply decorated dining room, tucked away in the streets of Chippendale (just three kilometers from Sydney’s city center), Chef Mat Lindsey creates innovative and delicious dishes – from a “sausage sandwich” to Moreton Bay Bugs and his signature roasted cauliflower – in a wood-fired oven at the heart of the open kitchen. The restaurant’s impressive list of awards in this year alone includes Australian Gourmet Traveller’s 2018 National Restaurant Awards Top 20 and Chef of the Year (Mat Lindsey) and #3 in the Australian Financial Review’s list of Australia’s Top 100 Restaurants. SixPenny: In the small inner-city neighborhood of Stanmore (seven kilometers from the city center), guests of Six Penny (ranked #4 in the 2017 Australian Financial Review’s list of the Top 100 Restaurants in Australia) are served by the chefs themselves. The intimate dining room on a quiet suburban street is simply decorated to let the food be the hero of the show here. Six- and eight-course degustation menu options are accompanied by carefully selected Australian wines. 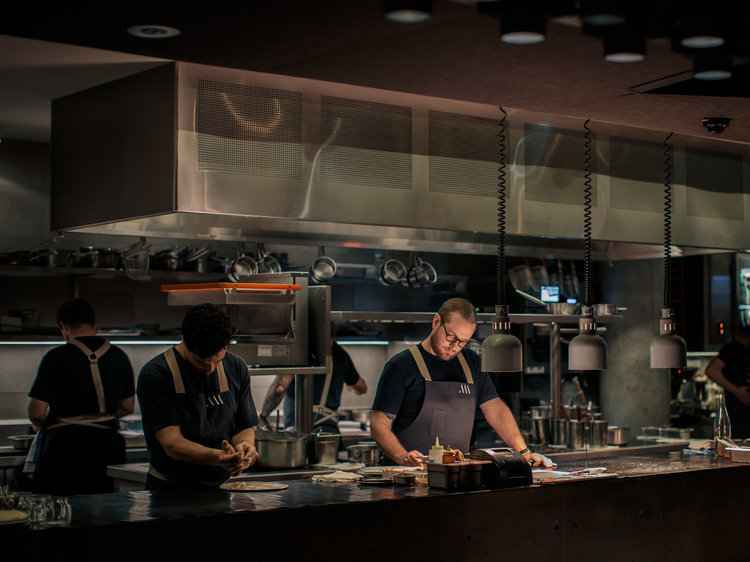 Firedoor, Surry Hills: Highly awarded Firedoor celebrates the art of cooking with fire. On a Surry Hills side street, the restaurant’s interior is rustic and simple, no fancy finishes here. Head Chef Lennox Hastie (who has worked in Michelin-starred restaurants across Europe) focuses instead on respecting the ingredients and showcasing their natural flavours. The Bather’s Pavilion, Balmoral Beach: A longtime Sydney favorite, The Bather’s Pavilion, Balmoral Beach is housed in the striking historic bather’s changing pavilion only meters from the sands of Balmoral Beach. Diners partake of award-winning cuisine under the direction of celebrated head chef Serge Dansereau in the dining room and more casual coffees or cocktails in the café (and you’ll get the same stunning beach views from both). Cirrus Dining, Barangaroo: Be among the first to welcome newcomer to the Sydney dining scene, Cirrus, which has already made a splash. In Sydney’s newest dining precinct at the new Barangaroo waterfront development, the menu focuses heavily on sustainably caught fresh seafood (with plenty of choice for non-seafood eaters, too) with shared plates and premium wines to match. Icebergs, Bondi with its quintessential Sydney setting overlooking the surf at Bondi Beach. The menu features award-winning modern Italian cuisine served inside or on the roof-top terrace. Yellow, Potts Point, a favorite of vegetarians, with a fully vegetable-based dinner menu (emphasis on vegan and organic) accompanied by a mostly organic and biodynamic wine list. Automata, Chippendale, with award-winning degustation dining in a converted warehouse-style dining room in the heart of the new Kensington Street entertainment precinct in the inner-city suburb of Chippendale. Rebecca Recommends believes in Southern Crossings’ expert knowledge of Sydney and environs. Their expert team can even arrange for your clients to enjoy a relaxed lunch at a local resident’s home on the beautiful Northern Beaches — the ultimate off-the-beaten-path dining experience. This typically includes a fresh, homecooked meal followed by a bushwalk with one’s hosts through some of Sydney’s most stunning waterside national parklands. One might even join their hosts in the kitchen to learn about indigenous Australian flavors, taking home a few tips and tricks. Another unique pleasure … a private luxury boat ride to the Sydney fish markets, where you’ll collect some choice ingredients for lunch, then savor a expertly prepared meal in your cruiser in a quiet bay on Sydney Harbour.